Be greeted by one of our representatives holding your nameplate as you come out of the baggage claim area in the airport. He’ll assist you with your baggage and accompany you to your preferred vehicle as agreed at the time of booking. Skip long taxi lines and hop inside the car for a comfortable drive to your pre-designated hotel anywhere in Hong Kong. Look out for great views, speak to your friendly driver about the top attractions to see here, and finally, arrive at your final destination both invigorated and relaxed. Admire the top attractions of Hong Kong including Aberdeen Fishing Village,Victoria Peak,Stanley Market and the Jewellery factory in complete comfort wherein our Vehicle Picks you up from your desired Hotel and drives you back safely after the Tour. Upon a prompt pick up from your hotel or desired spot in Hong Kong, you’ll be transferred to the cable car station at Tung Chung. Board a standard or crystal cabin to enjoy a panoramic cable car ride to Ngong Ping Village – the site of the celebrated Tian Tan Buddha Statue and Po Lin Monastery. For a detailed view of the Giant Tian Tan Statue, you’ll have to climb more than 260 steps. 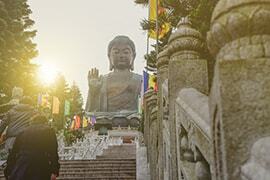 Further, make an entry to Po Lin Monastery, where you can explore its Great Hall as well as other structures. After an optional Chinese vegetarian lunch at the monastery complex, we’ll continue the trip to Tai O fishing village. With a boat ride along the stilt homes, you’ll be able to discover the region’s extraordinary allure. Return transfer to your rendezvous spot is included. Catch the best view of sky and land in Hong Kong from Sky 100, destined on the tallest building. The glimpse of Victoria Harbour, Hong Kong Island and Kowloon Peninsula is a surprise package from the floor. Also you can visit the photo booth and food corner. With a convenient pick up from your hotel, reach the cruise destination. Starting from Tsim Sha Tsui Public Pier or Central Pier 9, this cruise feasts you with the most stunning views of ‘A Symphony of Lights’ – a 15-minute light and sound show conducted on daily basis by the Hong Kong Tourism Board. A dazzling spectacle of colored lighting, laser beams, and searchlights will jazz up over 40 stunning structures along the harbor. Besides enjoying impressive views, you can savor unlimited drinks during this 90-minute cruise. Return transfer is included. Once your airport departure transfer is confirmed, one of our expert drivers will meet you at your hotel or exact spot at the said time in order to take you directly to the Hong Kong International Airport. You’ll enjoy a relaxed drive in the comfort of our pristinely maintained vehicle. 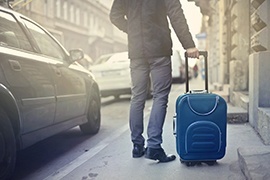 As you reach the airport on time, you’ll get professional assistance with your luggage. This is a super ideal retreat to experience Hong Kong! Being one of the East Asia’s most compact destinations, it’s highly regarded for its winning blend of strong cultural heritage, rich history, striking natural beauty, and the stylish avant-gardism. So get ready to come face to face with some of the most wondrous sights, as you book our all-inclusive four-night Treasures of Hong Kong and skip all potential strains of planning a perfect holiday. A sightseeing excursion with a live guide allows you to enjoy the astonishing landmarks in greater depth and detail. On the other hand, a visit to Lantau Island not only introduces you to the region’s dramatic scenery but also promises you some cherished moments with an opportunity to enjoy cable car ride and explore such celebrated attractions as Po Lin Monastery and the massive Giant Tian Tan Statue. 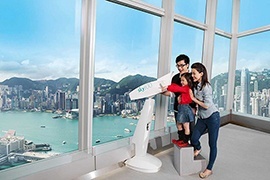 One of the highpoints of your holiday is the entry to Sky100 Hong Kong Observation Deck, known for its unbeatable lookout point perched 100 floors above International Commerce Centre (ICC). This treats you with the most astonishing 360 degree views of Hong Kong, Kowloon and Victoria Harbor. Above all, feel the city’s effervescent dynamism and sophistication as never before on a Symphony of Lights Cruise. Hassle free service by Rayna team! Absolutely well planned tour package! I and my family had a good time sightseeing in the city and Lantau Island as well. We also really like the Symphony of Lights Cruise. The show was a delight. I would really want to visit Hong Kong again to explore more! Was searching online for good tours in Hong Kong, and I came across this tour. This tour by Rayna Tours had something I did not know of, Sky100 observation deck. I quickly booked the tour, and turns out, it was the right decision. The Hong Kong City Tour, and the Lantau Island Tour were great, but the Sky100 Observation Deck was something else. The deck showed a magnificent view Hong Kong Island, Kowloon Peninsula and Victoria Harbour. What a thrill. To make things even better, the night ended with a cruise called Symphony of Nights. I strongly suggest people buy this tour to have a great time. Will surely come back to grab this tour again! 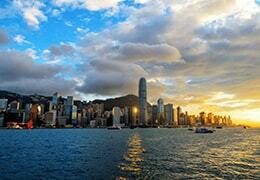 The Treasures of Hong Kong package truly delivers on what they promise - the treasures of Hong Kong. In the city tour, we get to see places like Aberdeen Fishing Village,Victoria Peak,Stanley Market and Jewellery factory. In Lantau Island Tour, we take a cable car ride and get to see Ngong Ping Village, Tian Tan Buddha Statue, Po Lin Monastery and Tai O. And to top it off., we also get to enjoy Viewing Deck at Sky100 and Symphony of Nights laser show and cruise. This is one of the better tours out there are is total value for money. Seating arrangement for all transfers are as per the availability & our tour manager allows it. The pick up/drop off timing can be modified as per the trip schedule. This also may change depending on traffic conditions and your location. Some of the mentioned inclusions may remain closed on weekends or specific days as per the government norms for which we do not hold the responsibility. The actual transfer timing may vary up to 30/60 minutes to the time listed on the website. Summer clothing is suitable for most of the year, but sweaters or jackets may be needed for the winter months. We recommend carrying sunglasses, hats and sun protection cream. Private Transport can be organized on request for all tours. Leaving off your personal belongings like Media equipment, wallets or any other valuable items in our vehicles or tour sites is solely at your responsibility. Our drivers and tour guides will not be responsible for it. No strollers allowed inside the vehicles without prior information so please inform us at the time of making the reservation. On Islamic occasions and National holidays, the tour will not serve alcohol, and there will be no live entertainment. Please read carefully and understand the contents of the Tour Brochure/itinerary, the 'Terms and Conditions,' Price Grid and such other documents as may be applicable, as all these will form part of your contract with us once you affect the booking. Photography of UAE residence especially ladies, military institutions, government buildings, and installations, is strictly prohibited. Littering is a punishable offense and offenders may face penalties in the form of fines. Smoking inside public areas is not allowed. Some tours require your original passport or Emirates ID, and we have mentioned this information in the critical notes so please ensure that you read the critical information, we will not be responsible if you miss any tour where your passport or ID is mandatory. We reserve the rights to charge 100% No show charges if the guest is not turning up on time for the pickup. Due to any uncontrollable circumstances, i.e. (traffic conditions, vehicle breakdowns, delay by other guests, weather circumstances), if the tour gets delayed or canceled, we will provide alternate options if possible. 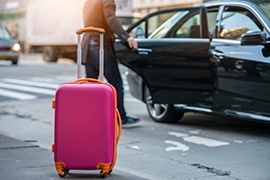 If in any case the guest does not show up on time and our vehicle departs from the pickup location then we will not arrange for alternative transfer & no refund is provided for the missed tour.